BlueM is gaining more momentum. And more interest. The BlueM Development Team has been asked to present the current status of BlueM and it’s further development both at the “DAWAKO 2017” at Technische Universität Darmstadt and the “German Day of Hydrology 2017” at Trier University. One of the major advantages of BlueM.Sim is it’s modular structure and the outer time loop, making the implementation of new modules relatively easy and straightforward. Currently implemented modules comprise natural catchment parts (including detailed SWAT modeling and diffuse pollution); lakes, ponds, and reservoirs (including complex management schemes); and river segments (including structured cross sections, flood routing and water quality processes). Urban structures like urban catchment parts, sewers, combined sewer overflows and waster water treatment plants have been coupled via OpenMI so far. BlueM.Sim is tightly coupled to BlueM.Wave for time series management and BlueM.Opt for multi-objective optimization tasks. BlueM.Wave is able to import and export a wide range of different time series formats whereas BlueM.Opt is equipped with several interfaces to interact with other simulation software. Given it’s wide range of functionalities, users of BlueM.Sim, BlueM.Wave and BlueM.Opt range from research institutions over government institutions to private companies. For example, the hydrological model core of BlueM.Sim forms the base of simulation-based analysis and planning methodology of the German Federal State of Hesse to identify critical impacts on receiving water bodies from the identification of critical impacts due to waste water discharges. For further application examples of BlueM please refer to our application page. Aside from regular bug fixes and enhancements, recent development has been focused on BlueM.Wave, where many new functionalities have been released in version 1.6. Currently, we are working on the direct integration of urban modules into the BlueM.Sim model core. While discharge routines have already been implemented and are currently being tested and validated, the development focus is now on implementing water quality routines as well, also for more stagnant water bodies like slow flowing river stretches above weirs, lakes and reservoirs. Further emphasis will be put on the capabilities of BlueM for immission based modeling together with respective post processing and evaluation procedures. 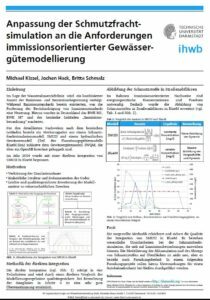 Michael Kissel was asked to present the blueprint for a direct integration of urban drainage modules into BlueM at the “Tag der Hydrologie 2016/Day of Hydrology 2016” held in Koblenz, Germany. The overall topic of the conference was “Water resources – connecting knowledge in river basins”. BlueM, with its integrated model approach and the planned development was a perfect contribution to this topic. Poster contribution to TdH 2016. You can access a PDF version of the presented poster from our publications list. BlueM – New site & management! We are happy to welcome you to the new BlueM website. Together with the new website we have made some fundamental changes in the management of BlueM which will allow us to focus much better on the development of the different parts of BlueM. More information will follow on this blog… stay tuned.